This document is part of a collection leaked by the anonymous hacker collective known as LulzSec. It is also worth noting that the ACTIC spells sovereign wrong in the title of the bulletin. 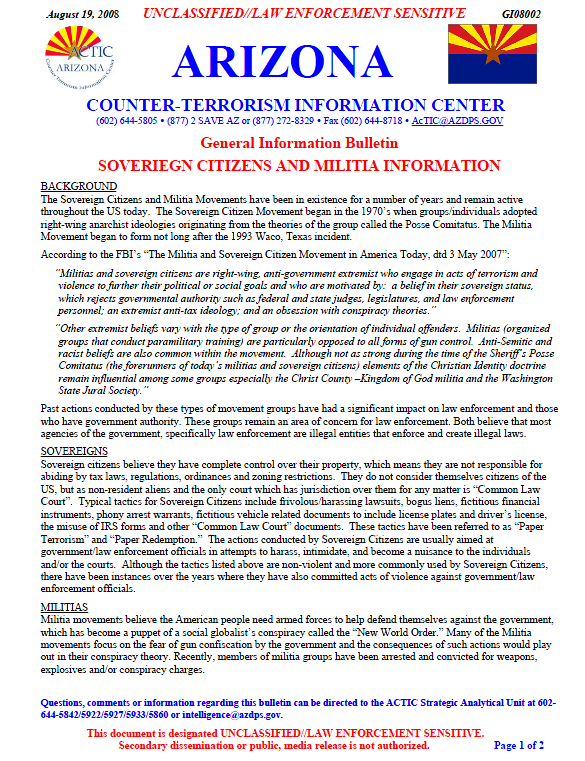 The Sovereign Citizens and Militia Movements have been in existence for a number of years and remain active throughout the US today. The Sovereign Citizen Movement began in the 1970’s when groups/individuals adopted right-wing anarchist ideologies originating from the theories of the group called the Posse Comitatus. The Militia Movement began to form not long after the 1993 Waco, Texas incident. Past actions conducted by these types of movement groups have had a significant impact on law enforcement and those who have government authority. These groups remain an area of concern for law enforcement. Both believe that most agencies of the government, specifically law enforcement are illegal entities that enforce and create illegal laws. Sovereign citizens believe they have complete control over their property, which means they are not responsible for abiding by tax laws, regulations, ordinances and zoning restrictions. They do not consider themselves citizens of the US, but as non-resident aliens and the only court which has jurisdiction over them for any matter is “Common Law Court”. Typical tactics for Sovereign Citizens include frivolous/harassing lawsuits, bogus liens, fictitious financial instruments, phony arrest warrants, fictitious vehicle related documents to include license plates and driver’s license, the misuse of IRS forms and other “Common Law Court” documents. These tactics have been referred to as “Paper Terrorism” and “Paper Redemption.” The actions conducted by Sovereign Citizens are usually aimed at government/law enforcement officials in attempts to harass, intimidate, and become a nuisance to the individuals and/or the courts. Although the tactics listed above are non-violent and more commonly used by Sovereign Citizens, there have been instances over the years where they have also committed acts of violence against government/law enforcement officials. Militia movements believe the American people need armed forces to help defend themselves against the government, which has become a puppet of a social globalist’s conspiracy called the “New World Order.” Many of the Militia movements focus on the fear of gun confiscation by the government and the consequences of such actions would play out in their conspiracy theory. Recently, members of militia groups have been arrested and convicted for weapons, explosives and/or conspiracy charges. Recent activity in Northern Arizona indicates there are individuals who appear to have beliefs very similar to those of the Sovereign Citizens Movement and/or Militia Movements ideologies. Federal land patents filings have reportedly increased in two of Arizona’s northern counties. Information has been reported that individuals filing land patent claims are stating/claiming the county officials (assessors, land use, sheriff’s deputies) have no authority over them. Additionally, individuals have sent papers in stating they do not have to pay taxes. At this time, the reporting supports the theory that the actions of these individuals are consistent with Sovereign Citizen and Militia ideologies. The following indicators (not all-inclusive) have been provided to assist law enforcement with identifying of individuals they may encounter during traffic stops or calls for service who may be involved in these movements and/or have similar ideologies. All law enforcement personnel are reminded to maintain heightened situational awareness when encountering subjects suspected of supporting Sovereign or Militia movements. • Have a fictitious/peculiar or NO license plates. The plates might claim to be from a non-existent entity like the Republic of Texas (any state), Washitaw Nation, Kingdom of Heaven and etc. They might include numerous variations on the themes of “sovereign citizen,” “sovereign american,” “Common Law,” “UCC1-207” (or other UCC themes; these refer to passages in the Uniform Commercial Code), “militia,” and biblical passages. The plates can range from homemade cardboard plates to stamped metal plates that look very legitimate. • Have a fictitious or NO driver’s license and/or registration. They may claim they do not need the items on the basis that they are not driving a commercial vehicle. Many extremists claim that the laws requiring such documents apply only to vehicles used for commercial purposes and/or that driving is a right, not a privilege. • Have peculiar bumper stickers or display strange car decorations. There are companies who market stickers to anti-government extremists and they are readily identifiable. Examples from one company based in St. Marys, Kansas, include: “And the Lord said (Luke 11:46, 52) ‘WOE to YOU LAWYERS’;” “Free the Slaves, Abolish IRS and the Federal Reserve. Other car decorations could include homemade placards, signs in windows or along tailgates and/or display “militia identification numbers”. • Make strange statements (driver or passenger) and refuse to identify themselves. In response to a request for a license, registration, proof of insurance or other form of identification the individual might make a response with referencing the items as “contracts”. Any references to these documents as “contracts” should be a warning sign; so too should any statement to the effect that they are not required to possess them. If they self-identify themselves as “sovereign citizens,” “non-resident aliens,” “sovereigns,” “common law citizens,” “state citizens,” “freemen,” “constitutionalists,” or claim some other pseudo-legal status, they are providing police with valuable information about their nature. Any suggestion that the Constitution or the Bible gives them an absolute right to travel unregulated, or if they present the officer with a Bible as a driver’s license, can be considered a warning sign. Requests the officer to produce an arrest warrant can also be a sign. • Hand the officer political literature or strangely threatening documents for him to read or sign. Anything that reads “Notice to Arresting Officer” or “Form CRIF 2PA95” or which purports to explain the law to the officer should be taken as a warning sign. • Attempt to audiotape the conversation. As a cautionary note, Sovereign and Militia movement individual(s) (driver and passengers) have been known to be armed and/or have concealed weapons in their vehicles. Additionally, beware of the possibility they may have another individual in a vehicle following or nearby. Law enforcement officers are reminded to remain vigilant and to follow eir agencies procedures and protocols when dealing with these individuals. Report any such contacts to the ACTIC.